First purchase from TST and it won't be the last! Product shipped with 3 hours of ordering! WHAT?!!!?! Great quality product! Taillight fits OEM and is way brighter than stock. Finally got rid of those ugly, floppy rear turn signals. This product is well worth the money. It is nice to have a strobe feature with the brake light as it grabs the attention of cagers behind you. It looks better than stock as well. My stock taillight would sag down in the tail fairing. I thought I would have to deal with this forever but the TST taillight fits in perfectly and doesn't sag at all. Very good quality light , plugs easily into factory harness . Plus you don't have to splice anything just like oem . Love the different settings you can choose for it . Thank you again for exceeding my expectations. Awesome light!!! 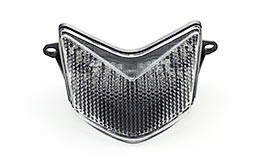 I ordered one with the smoked lens cause my bike is black and it blends right in with the plastics it look really sleek cause the thing fits perfect!!!! Then when the bikes on this light is nice and bright! love the flashing feature for the brake light it grabs attention for extra safety and the sequential signal light looks f-ing cool!